We would like to invite you to browse through our site and feel free to contact us about our dogs or National Shoot to Retrieve Association. We offer top quality breeding, puppies, training, trialing, started and finished Hunting dogs. Our dogs come from some of the very best of the breed for hunting and field trialing and have been proven to uphold that, through our program. They have the fire it takes to cut it under all conditions yet have the temperament that makes them great family and companion dogs. 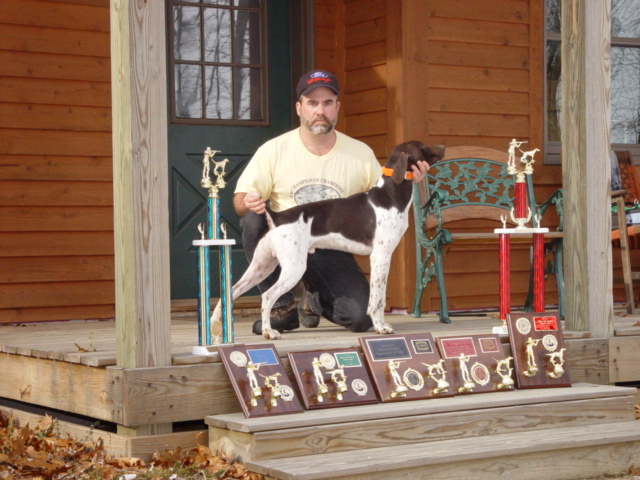 Trainer and kennel owner Scott Townsend is shown with Fritz, one of the kennel's up and coming celebrity along with a few of his trophies.